On June 26th, we set out on another marathon trip to speak six different times in a two week period. The first part of the trip was spent in Tennessee speaking to three different churches and twice on the Lipsomb University Lectureship called, “Summer Celebration.” Summer Celebration was tons of fun as we got to see many familiar faces, and I got to hear some great singing groups. 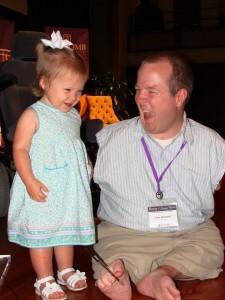 The picture you see is of my daughter, Hannah, helping me great people after one of our presentations. We were having fun making faces at each other, and she is always the star of the show. After our Tennessee engagements were done, we hit the road for Kansas City were I got to speak at the Teenage Conference hosted by Children’s Mercy Hospital of Kansas City. There, I spoke to many teens (and their families) who all had experienced life-changing medical events within the past year. These teens were by far my favorite crowd to speak to as they were not only attentive, but could very easily identify with the challenges that I’ve faced. In fact, I joked several times about “preaching to the choir” as some of them had dealt with more difficult situations than I have. Their questions were so insightful, and I came away so blessed to have been able to share my story with them. Next up for us, a quick trip to downtown Fort Worth to speak for the Social Security Administration on overcoming challenges and choosing happiness. Then, it’s on to Wichita, KS to preach at a chapel service at a camp for young adults who have muscular distrophy.